Upon seeing these signs, an angry pro-choice mother asked, "How can you allow little children to see those horrible pictures?" The pro-life mother wisely responded, "How can you allow little children to be those horrible pictures?" 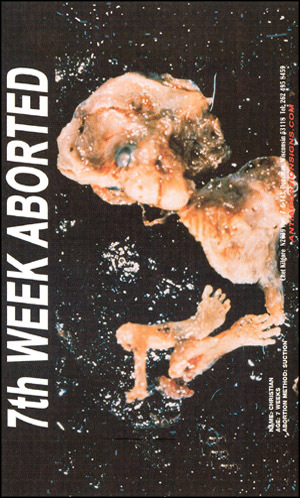 This sign shows the body of a 21 week old preborn baby, killed by a D&C abortion. It is in full-color, 60" wide x 37" high, and is available in a laminated version only. Please see the order form for pricing & ordering information. This powerful sign illustrates the horrible similarity between Hitler's murder of 6 million Jews, and America's murder of over 30 million pre-born babies since 1973. 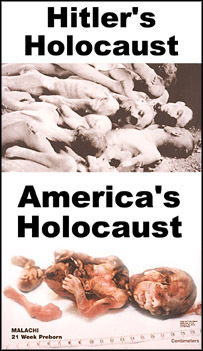 Let your community know about AMERICA's holocaust, by showing them the truth about this horror. It is available in 36"x21" and 63"x36" sizes, fully laminated. Please see the order form for pricing & ordering information. 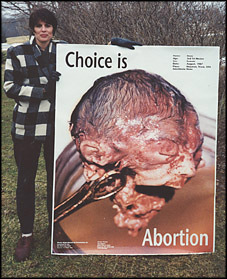 This sign features the severed head of a preborn baby girl, aborted in the third tri-mester of her mother's pregnancy. 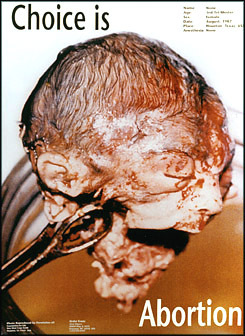 When abortion advocates talk about "FREEDOM OF CHOICE", this is the result... the grusome death of a precious child. The sign is available in 36"x27", and 44" x 60" sizes. Please see the order form for pricing and order information. 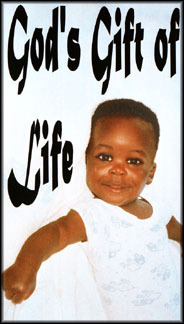 This giant sign celebrates God's wonderful gift of human life, by displaying the smiling face of a precious little boy. 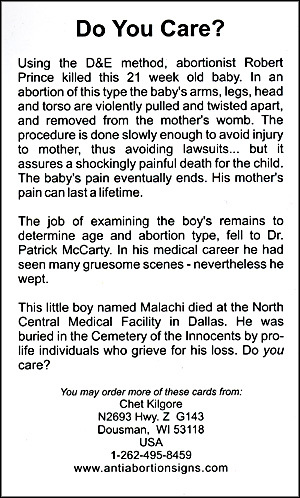 It stands in stark contrast to the horror of abortion, and appeals to the hearts of those who might be contemplating abortion. The sign is available in 36"x24" and 54"x36" sizes, fully laminated. Please see the order form for pricing and order information. 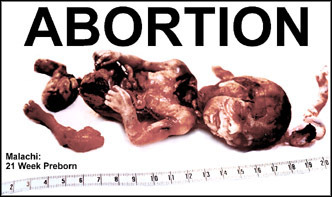 This shocking sign shows a baby killed by a first-trimester D&C abortion. His humanity speaks for itself. The sign is 46" wide x 36" high, and is fully laminated. Please see the order form for pricing and order information. 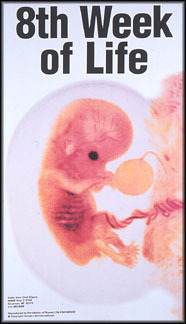 This tall sign illustrates a living preborn baby at just 8 weeks from conception. It is available in 21"x36" and 63"x36" sizes. Both are fully laminated. Show your community the unmistakable personhood of the preborn. Please see the order form for pricing and order information. These dear little girls holding hands will appeal to even the hardest heart. The sign is fully laminated, and available in sizes 30"x36", and 36"x44". Please see the order form for pricing and order information. 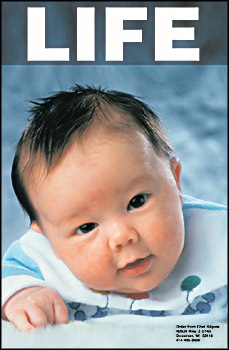 Like our other LIFE signs, this precious baby boy will remind mothers what they have to loose if they choose abortion. Life really is a gift from God. This sign is available in 36"x21" and 63"x36" sizes, both fully laminated. Please see the order form for pricing and order information. 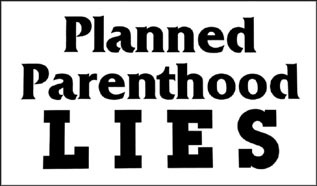 Here's a sign that tells the TRUTH about Planned Parenthood. It measures 63" wide x 36" high, and is fully laminated for long life. Please see the order form for pricing and order information. Here's a sign that also tells the TRUTH about Planned Parenthood. It is available in 36"x29" and 45"x36" sizes, and is fully laminated for long life. Please see the order form for pricing and order information. 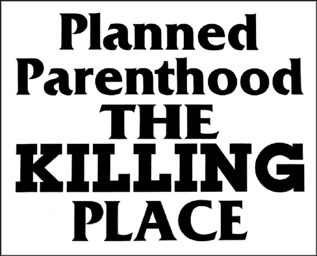 Many of your neighbors still do not know that PP kills more children than any other organization in America. Let them know! The sign is 42" wide x 36" high, and fully laminated. Please see the order form for pricing and order information. These small 3"x5" cards are "mini-signs", with full color on the front, and include black text on the back. They are excellent for distribution in public places, inserting in envelopes when paying bills or when writing to friends & associates. Please see the order form for pricing and ordering information... keep a bunch of them on hand! If you ask people why they do the things they do in life, they will give you sensible sounding reasons which seem to explain their decisions. We like to believe that we exercise sound judgment, especially in the important decisions of our lives. I think that this is rarely true. I think that standard operating procedure for human decision making is to do what feels right to you at the time, and then to give logical sounding justifications for what you were already going to do anyway, whether you had justifications or not. So, if you are pregnant, and want to get an abortion, you will be able to give any number of reasonable sounding explanations why this is the right decision. You're not ready to be a parent, or you need to finish your education or get to a better point in your career, or you don't have enough money, etc. If instead you want to keep the baby, you will explain how even though you will have some extra difficulties due to the lack of money or whatever, you will certainly be up to the challenge to make your life work with the baby, how being a parent will be good for you, what a great parent you'll make, how it will bring you and the father closer together, and so on. In either case, none of these will be the real reason for your decision. The real reason for your decision will always be, "I did it because I wanted to do it." Carter Heyward, an ordained Episcopal priest who has been active for many years in the feminist movement. 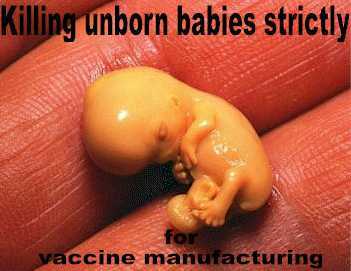 Aborted Fetus Material is Being Put into Vaccines! Auschwitz in the United States! Why SHOULD God Bless America? 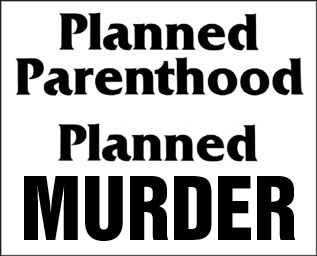 | How is Murder "Planned Parenthood"? 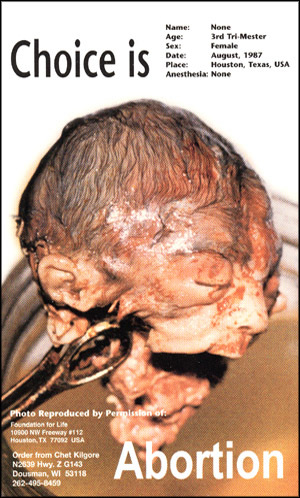 Before I Formed Thee... | Partial Birth Abortion Scam | Forced Abortion in America! Number of Abortions! 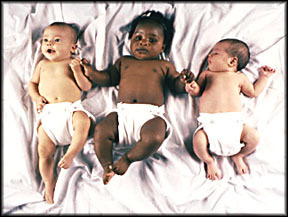 | Hundred of Fetuses | Hypocrisy of America! Horror in Plano Texas! | Planned Parenthood is Evil! 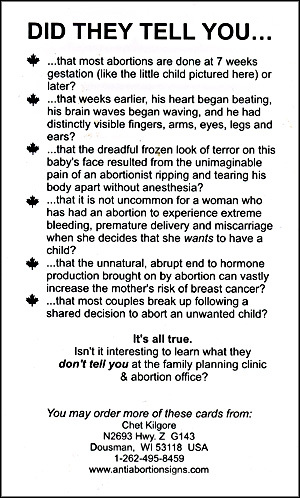 See Inside An Abortion Death-Camp! | EU to Doctors: Thou Shalt Abort! 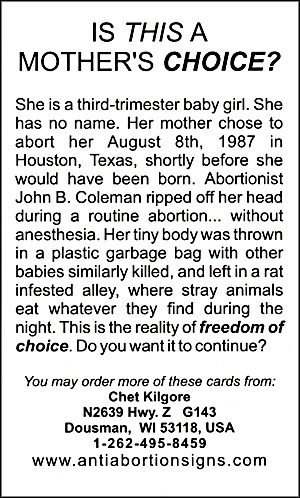 Abortion is Witchcraft!!! 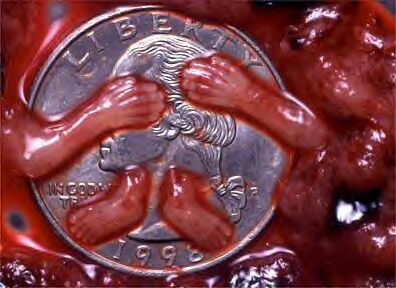 | Abortion Spending | Abortion - America's Killer! 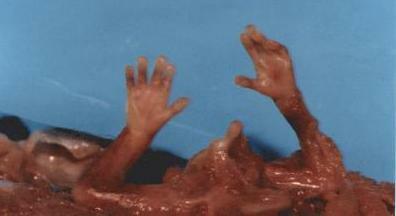 "In 1988, the Supreme Court decided that a husband has no right to stop his wife from having an abortion. The appeals court, which passed the decision onto the Supreme Court, had stated that the husband 'has no right to veto [his wife's] decision [to have the abortion] as such [a] decision concerns only her.' "
SOURCE: The New World Order, pg. 239, by Ralph A. Epperson; 1990; ISBN: 0-9614135-1-4; publisher: PUBLIUS PRESS, Tucson, Arizona. 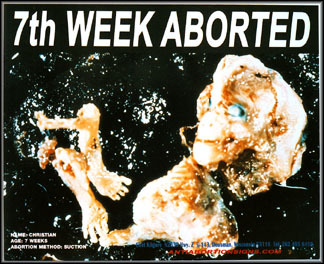 Abort73.com exists to cut through the skewed rhetoric of a broadly “pro-choice” culture by presenting young people with the conclusive evidence that abortion is a massive injustice, one which has and continues to systematically destroy the most innocent and helpless members of the human race. 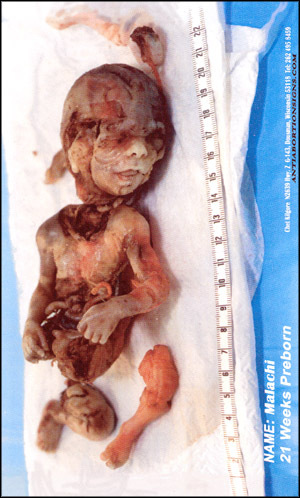 Abort73.com further exists as a gateway into the more fundamental questions of human existence. Where does human life come from? From whence does evil emerge? What is the meaning of life? "To educate our Hispanic community regarding the life issues, especially the hate crime they have been subjected to by the abortion industry and promoters of abortion."